A bus driver and motorist were caught on video driving aggressively in an incident of road rage along Raffles Boulevard. 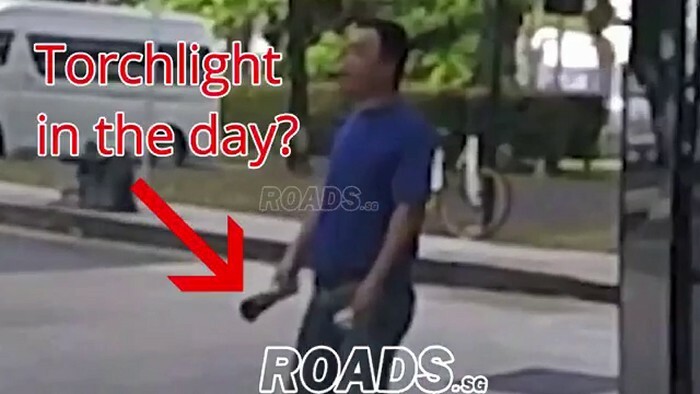 The three-minute video was posted on ROADS.sg's Facebook page on Thursday (Nov 29). However, according to the post's caption, the incident happened in October this year. In the video, events escalate after the driver of the car with the dashboard camera recording the footage does not give way to the bus driver who is indicating right to change lanes. Road rage between the driver of car and bus along Raffles Boulevard. Good on the uncles to help diffuse the incident towards the end. The two drivers then repeatedly take turns cutting in front of one another along Raffles Boulevard until the car driver pulls over in front of the bus and gets out of his vehicle to confront him. The bus driver then overtakes the car and gets out in front of him along with another man who is unexplainably holding a flashlight in the daytime. In their "showdown", the bus driver shuffles around on his feet and gestures at the car driver to come at him. The car driver remains relatively calm although their conversation cannot be made out. Eventually, a couple of onlookers step in to try to diffuse the situation before the drivers return to their vehicles.